Case of lodgement, for four months, of the breeching of a fowling piece in the face, at the front of the nose ; and safe removal. Aberdeen : G. Cornwall, 1858. Description :  p.,  leaf of plates : ill. ; 21 cm. Photographs : 2 albumens mounted on 1 leaf. Subject : Skull Fractures. Wounds, Gunshot. Eye Injuries. A Scottish physician who practiced in Aberdeen, William Keith was Senior Surgeon to the Royal Infirmary, a lecturer on clinical surgery and a specialist in lithotomy. 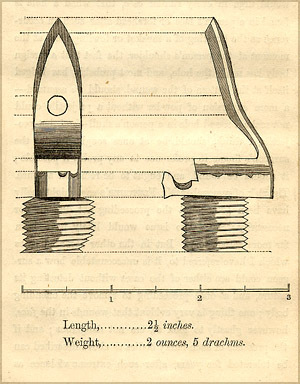 On the 25th of June, having seated Scott firmly in a chair with his head steadied against the breast of an assistant (Dr. Redfern), Dr. Keith forcibly separated the nasal bones, so as to enable him with a powerful molar tooth forceps to grasp the tip-end of the screwplate of a fowling-piece breeching, and after splitting the nasal bones widely from each other, and fracturing the nasal process of the left superior maxillary bone, he was able by a strong twist and a steady downward pull (using both hands), to bring away the whole breech of a fowling-piece, weighing two ounces and five drachms, and measuring two inches and a-half in length ; the thick or screwbolt end having entered first, and penetrated so far as to allow the very tip of the screwplate to be covered in by the skin of the nose. Doctor Keith provides an engraved drawing of the breeching projectile. He also provides a brief review of the literature for like cases including that of a Thomas G. who lived for 14 months with a portion of breeching lodged behind the parietal bone. The patient suffered only a sensation of tremendous weight in his head, such that "his head felt to be a ton weight ; and so heavy that he could not raise it from the pillow." William Keith concludes his paper with an admonishment that wounds of this kind be treated with the assumption that there are lodgements of foreign bodies that can only be detected by the finger and these bodies be immediately removed.